... but if you try sometimes, well you just might find you get what you need. Ok, so who remembers the show Northern Exposure? 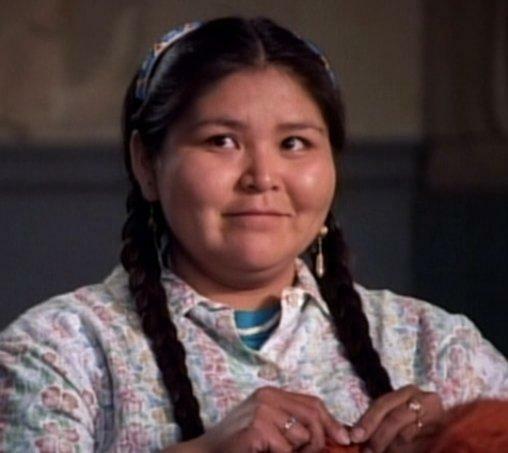 Remember Dr. Fleishman's Eskimo receptionist, Marilyn Whirlwind? Adorable, isn't she? Anyhoo, as a budding young preteen/teen, her character always struck me with her wise and quiet simplicity, and the way that when she *did* speak, she stated exactly what she needed to, no more and no less. One episode struck little developing Andy quite profoundly, as she had gone missing, and everybody was panicking trying to find her. Eventually she was discovered... sitting on a bench at the zoo, enjoying a cone of vanilla soft serve, and contentedly watching the world go by. Immediately, I realized this was the way to be, this centered state of solitary bliss, savoring two of the world's simpler yet profound pleasures with a perceptual and spiritual depth that most others would simply not be sensitive enough to grasp. Little Andy finally had a role model, and to this very day, a large portion of my adult personality is still based on her character's zen-like state of sage chill-outedness. I've done a pretty good job of emulating Marilyn. Some of my most treasured life moments have been, and even still are spent, even if in a sea of strangers, otherwise completely alone. I used to love going to the movies and restaurants, and any number of other activities that most would consider unimaginable without a partner. They'd look at me like I grew another head when I'd tell of the things I'd done all by me onesy, and frankly, I'd look back at them in complete puzzlement as to why they were acting like I'd skinned a live kitten. I blissfully glide across the ice at Hobart Arena, surrounded by hundreds of people, as though I were the only one there. Last night Jen and I officially called it "better off as just friends". Our relationship has never been better, and I'm closer to her than I've ever been. But I'm also more lonely than I've had to endure in a good while. And tonight, as Shaggy has found an amazing woman to spend time with, and thus has been less accessible to me, I found myself in a state where there were none to keep company with. And I kinda freaked out a little bit. I'd lost my inner Marilyn who would have reveled in "alone time". So I meandered down to the L&V, my perennially favorite watering hole, expecting nobody to be there, but instead ended up striking up a conversation with someone visiting family for the holidays. Turns out he has produced a calendar featuring photographs he has taken of traditional, romantic, and otherwise postcard moments... only interrupted by someone's dog squatting to poop in the foreground. It was definitely an unusual conversation, and while I'd hoped to have my hollywood moment locking eyes with an unfamiliar yet fetching young lass from across the room, alas such was not meant to be. Instead, I spent the night happily chatting away with a kindred unusual artistic soul. You meet the damnedest people in this town.